Our awards pay all or part of fees associated with courses, both residential and non-residential. We are unable to contribute towards the costs of purchasing musical instruments or other equipment required to support musical studies. Our awards are designed to cover the main costs of taking part in the activity – course fees, residential fees and transport – and are modest, typically for sums between £60 and £600. "Thank you for my experience in the ESO. I've never been on an orchestra residential course before and did not know what to expect. I had an amazing experience and would love to come back." Our awards focus on musical education rather than musical performance. An eligible event must have a substantial component of teaching or coaching designed to advance the applicant’s instrumental skills. This educational dimension is typically self-evident within specific courses, summer schools, masterclasses and so on, including where they lead to a final performance. In the case of a tour however, we are unlikely to assist those applying for help with the costs associated with taking part in musical performances at one or more venues where there is not also a clear and substantial educational component. We are able to pay the applicant’s costs of transportation to and from the activity’s venue, but only by the option with least cost, typically either the price of an advance rail fare or of petrol if travelling by car. I came away from the course feeling more confident of my violin playing. The music we played presented a great challenge to me and I believe that I benefited hugely and am now a much better violinist. The course also had a great social side from which I gained new friends. The concert at the end of the course was my favourite part and I think it was a phenomenal experience. Thank you once again. We do not offer ‘repeat’ awards; that is, we do not provide awards to enable a previously successful applicant to attend a particular activity for a second time. Moreover, a previously successful applicant is unlikely to receive a subsequent award (e.g. for a different activity) if it takes place within 24 months of the previous one. We welcome applications from those who are seeking part-funding for the activity’s costs, for instance where the remainder is to be paid by another charity, by the applicant’s family or by independent fundraising events. We take up references before making a decision regarding an application that seems to meet our criteria for awards. The referee is asked to confirm the details that appear on the application, to the best of their knowledge. 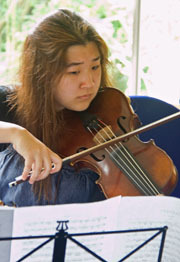 "It was inspirational working with the three brilliant tutors who are all eminent musicians themselves, due to their unique insights into the repertoire, especially as they all share the same passion for stylistic playing interpretation. Not only did I learn a lot musically from the course, but I also learnt a lot technically, by watching their free bowing arms draw the sound from the instruments." No payments are made direct to applicants or their families, except small sums as contributions towards transport costs. Where an application is approved, we notify the activity provider that we will pay the agreed amount after the activity has taken place, once we have received confirmation that the individual has attended the activity. We are unable to fund a place on a course for instance where the place is not taken up, whatever the reason may be for the individual’s absence. If the application is successful, the applicant and any grant-aided relative or friend will be expected to write briefly to the Trustees after the activity to indicate how they feel they have benefited, and including any suggestions for future improvements to the services we offer. For more information about the sort of young people we help, click here.